International Orders: E-Mail Me FIRST or delay! - Reason: Shipping Charges Inacurate! #20 = 7 mm x 8 mm - sloted for push switch mounting - drill out? (sold plasitc material inner core) $7.00 ea. #40 Function lever from AKAI X-1800SD, solid alluminum SOLD OUT !! These Knobs are typically $20-$55 ea., but are deeply discounted if purchasing more than one item. For example: most orders of 3 knobs often will be $45, plus $5.35 for postal service shipping within the USA, or $12.00 for international priority mail shipping. (For example: Knobs in G 7, 8). I have Output Transformers, Interstage Transformers, Chokes and Power Transformers. As time permits I will list these items in detail. 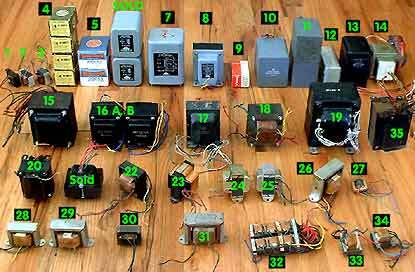 Below picture shows all available transformers. #5 = 2 Thordarson 20C53 power choke: 12HY 80 mA DC 375 Ohms, standard transformer type chokes in original Box NOS $25.00 ea. 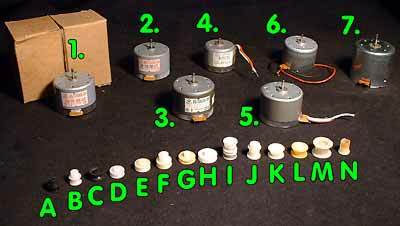 #5 B = 1 Thordarson 21F09 filament transformer: IN: 117V AC - OUT: 6.3V CT @ 1.2A in original Box (same box as #5) NOS $20.00 ea. 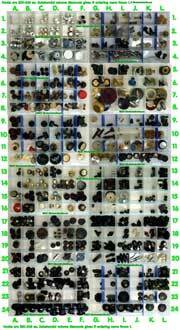 #11 2 Power Chokes: Made by Chicago Standard Transformer Corporation TF1A04YV / or Audio Development Co A8482. 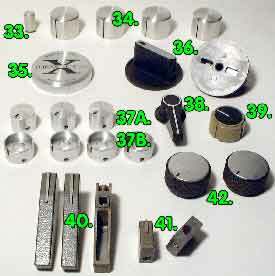 Specs: 4 HY 0.35 A 55 Ohm DC resistance, Max V. W. 540. One has date stamp: MAY 9 1955. Both came out the same model of equipment, but each appears to have been manufactured by different compaines to the identical specifications. Slight varinaces in appearance - $45.00 ea. 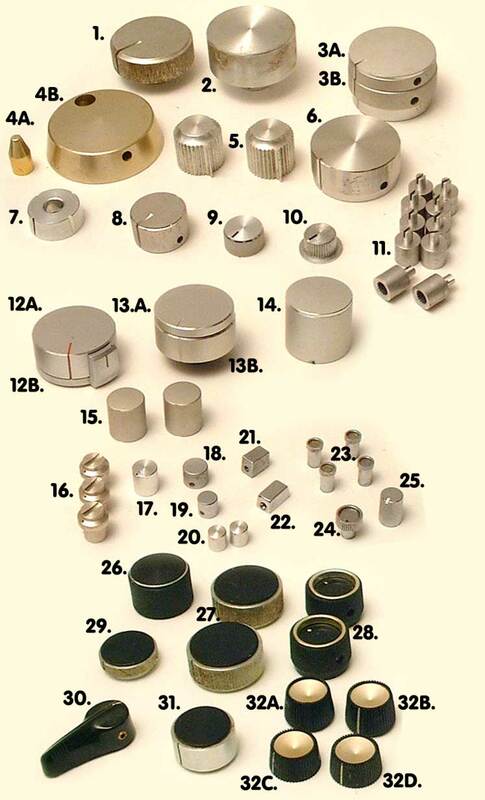 If any specific transformer in above picture is of interest, e-mail me about which one, and I will get you the specifics. More information added as time allows - Check back for more items listed on this page! 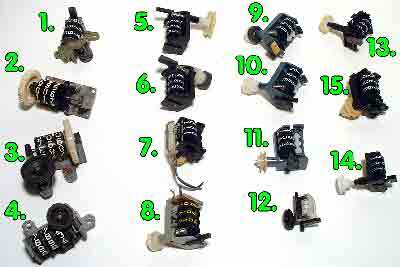 These switches came out of various vntage equipment from the 70's and 80's, including Marantz, Sansui, Sony receivers and amplifiers. Switches are $35.00 ea. As time permits I will list these items in greater detail. Below picture shows all some of the availalbe switch assemblies, which also can be taken apart to substitute a single switch. Type Description All motors shown here have speed regulation circuitry and a speed adjustment trim pot. These operate stable even if supply voltage changes to some degree - thus supply voltage does not have to be exact, but should be within reasonable range (+/- 2V). All pulleys are selected to fit above motors. $5.00 ea. Order by letter as shown in picture. Only 1 available each! Will note here which have sold. Currently available: All - None have sold. As time permits I will list these items in greater detail. Below picture shows all available meters. LOOKING for a ready to use VU-Meter Module? Find it HERE! #2. 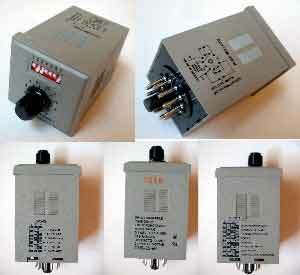 2 Hewlett Packard RMS Volt meters - IMV 600 Ohms - scale: 0-1.0V RMS and -10 - +2 dB (Mfg. date: 1962) $55.00 each or $95 for the pair. #3. 1 Westinghouse Ammeter 0-9 A (AC?) Type: CAY-22239-A says: "Radio Frequency" (item location: round at the left edge of above image. #19. Vintage Simpson AC Voltmeters; 25V AC. For top panel mounting; round cut-out plus 4 mounting screws - 2 avail. Not Shown: 2 Track direction indicator meter from UHENR CR124 / CR 134 portable cassette decks (not shown.) 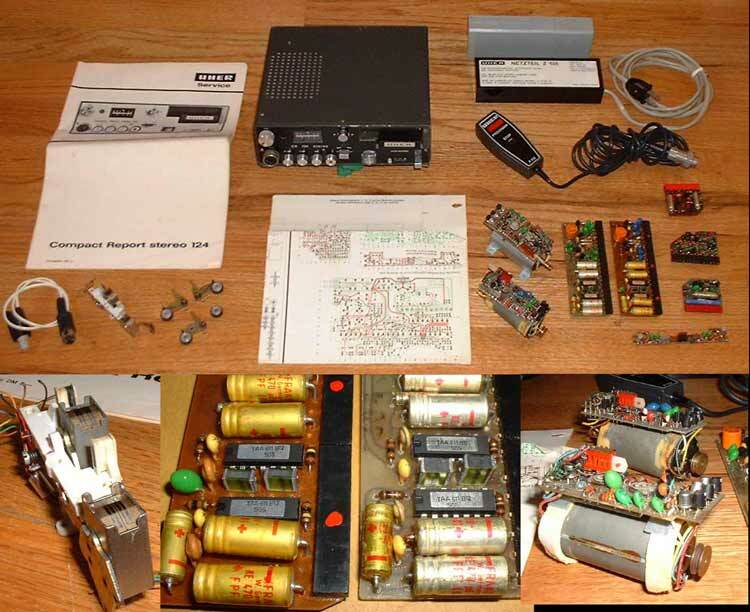 More UHER PARTS! 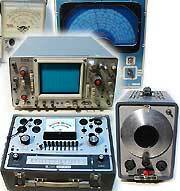 #9. through #17.: Various LED bargraph meters up to 12 digits from various equipment including: SONY, Sharp, etc. Obsolte Power Chords, XLR - Cables and Vintage Connectoes have MOVED! These are brand new never used timed relays. These can be programmed for various functions and their timing ranges can be pre-programmed via DIP switches. The timing within the programmed range can be adjusted with a potentiometer. These were for a project that was canceled - My loss your gain. 4 Available. The current street price for these is: $79.05 ea. - selling for $60.00 ea. - More detailled spec sheet avaialble!  Buy  Secure and Easy Payment through Paypal and other payment methods avaialbe. As time permits I will list these items in greater detail. Below picture shows all of the available counters. #6 + #9 have a rotating magnet to comunicate with a reed switch for tape run sensing applications. #7 has a zero electrcial contact swtich, which closes when the counter reaches zero. #8 has a zero sensing electrcial contacts, which close when the counter reaches zero. #11 is side driven which is differnet form all oher counters, of which most are bottom driven and 2 are top driven. #7 + #9 require an external push button to press against the reset plate. 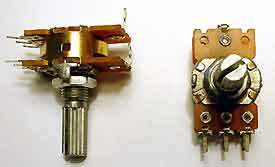 These 250K Ohm potentiometers are used in vintage audio equipment. They feature audio tapers with a center loudness tabs and are double layered. These are labeled as: B250K, but measure in about the 200K Ohm range. Inquire about other potentiometers form vintage audio equipment. PLEASE provide size, value and type information (mono, stereo, 4 layer; wiht ot without loudness tab at what position, shaft lenght and diameter, etc., etc. The model number of your equipment does not help me much! Please note: assited parts purchase that require me to search and send pictures are $35 fo rthe first part and volume discounts apply when more than one part is ordered. Often I have to be very creative: pull used parts form similar equipment, custom modify, or even custom fabricate from scratch. 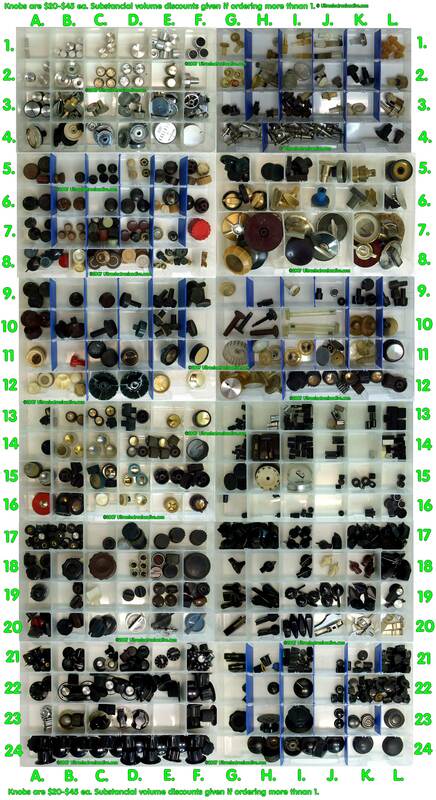 The correspondence for finding the right part for you takes a lot of time! To be exact: my work time that I need to bill for at my regular shop rate, as time spent answering parts inquiries is time not spent on my work bench. Thus: $30 minimum for the first part. I offer service for hard to find parts inquiries only, because: I myself know first hand how frustrating it is, not to be able to find them, and I need to bill for my time. Other than that: Glad to help! CUSTOM ORDER ITEMS, that is anything that requires direct interaction - are $30 minimum for the first item. No parts inquiries answered over the telephone -> submit by e-mail only! AND: Custom Order Parts not returnable and without any Warranty. 3) Any additional descriptive information, such as: 3A): what the part is, what it's function is - where (e.g. in the cirsuit) AND how it is used; 3B): values (example: capacitors, potentiometers, transformers, semi conductors, etc: K Ohms, uF , voltages, current requirements, etc. AND: physical dimensions (in inches or millimeters) - especially important for belts! 3D): type: for example "square" or "round"
I will e-mail you one photo of parts that potentially may work, to offer purchase options, or for discussion if nothing closely matching is available - BUT: After sending you the first photo / e-mail, I require a non refundable $25 deposit to compensate for my work time, before further materials can be e-mailed to you. NOTE: Due to the nature of obsolete vintage audio equipment and its obsolete parts: There are NO WARRANTIES expressed or implied, that I may be able to help, nor that I have or can provide the needed part, nor that parts that I may have will work, nor work for for your specific purpose - even if it may look it will work! Your payment pays for my work time only, to review your materials, search my stock, equipment, or parts sources, and most important: for the time needed for correspondence - thus: NOT RETURNABLE. Although: All of my efforts will focus to aid to the best extent possible for a solution to provide parts to get your equipment working again! - Proud of 30 years of experience in working on vintage Audio Equipment! AND: with those who are valuing my time with payment I may gladly share any information such as: where to potentially find it, or how to substitute / reapir, etc. Alternatives to my $30 minimum and "not retunable" policies: Browse my web site and simply purchase available items via the Paypal shopping cart on my web site. Or: If I get enough inquiries for items that I may be able to offer readliy available, I may in response to your inquiry make these items available to the shopping cart, saving you the processing fee (and my work time! ).